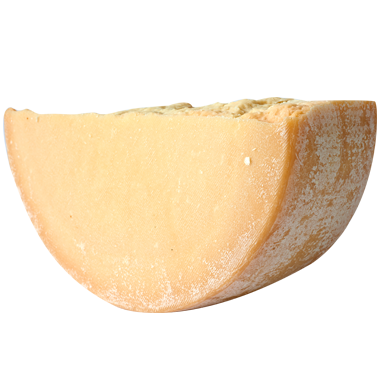 Born in the upper Po River Valley of Northern Italy in the Middle Ages, parmesan is a soulful and legendary cheese. It gained early popularity in the 14th century for the enormous size of its wheels, virtual indestructibility, long shelf life and incredible depth of flavor. Here in America, Wisconsin leads the pack in quantity and quality when it comes to this sweet and savory, nutty and complex cheese. Our cheesemakers have really embraced this cheese’s proud tradition in mastering that classic flavor profile of butterscotch plus salt plus that signature parmtastic tang. Buttery, sweet and nutty, and more intense with age. There’s nothing to relay that you don’t already know. Parmesan stores well, grates well, melts well, pairs well. Well, then, mangia! Serious cheese deserves serious drinks, so we like to pair parmesan with chianti, pinot noir, malbec, syrah, champagne, prosecco and riesling. We also like the strong stuff with it including grappa, nocino, sherry and madeira. Parmesan is one of those always-in-the-fridge cheeses for us because it’s so dang tasty and versatile. When we serve pasta, grilled veggies, minestrone, summer salads and pizza, you’ll always find a heaping bowl of finely-grated parmesan in the middle of the table. We also really love it on roasted cauliflower. Just as the cauliflower starts to brown and slightly caramelize, we finely grate parmesan over it and throw it back in the oven for a couple minutes to melt. Roasted potatoes, eggplant and chicken parmesan (duh! ), caesar salad and lasagna all can’t imagine living without it. Italians will even serve parmesan for dessert with fresh figs, walnuts and the sweet Tuscan dessert wine vin santo.